Something very strange is happening to the Great Red Spot on Jupiter as it shrinks, and scientists are trying to understand why. An extraordinary new finding by scientists suggests that as the Great Red Spot on Jupiter shrinks, something very bizarre is happening to it. 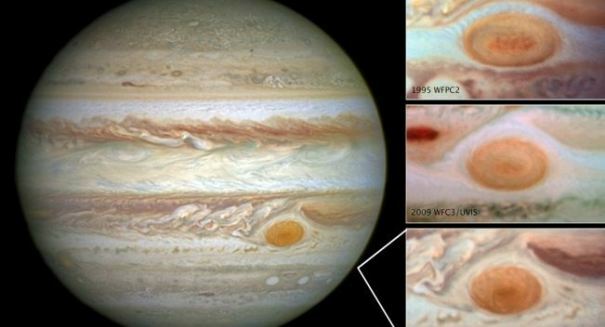 The massive storm has been in its death throes in recent years, with new data from the Juno spacecraft suggesting it may be gone within our lifetimes, and new research out of NASA indicates that not only its size is changing but also its shape. The latest images from Juno show that the storm is undergoing some surprising changed, as it is now at its smallest point that we have ever observed. The storm appears to be growing taller, with winds reaching higher and higher up in the atmosphere of the gas giant. It is also undergoing a color change too, starting to turn a bit more orange as the very highest of its gasses get hit with ultraviolet radiation. That’s not to say it is small by any standard, as it is could still fit the entire Earth. But the writing is on the wall for this iconic Jupiter feature.